The Allergy Shop in Charleston is your premier Charleston Bed Bug Supplies and Charleston Bug Protection Center. Bed Bug Protective Bedding of all sizes are readily available including Bed Bug Mattress Encasement and Bed Bug Pillow Encasement or Bed Bug Mattress Cover and Bed Bug Pillow Cover. Bugs are nothing to be embarrassed about. They seem to be everywhere. While unusual, they can be transferred from one person to another my merely brushing against each other in a crowd. There isn’t such a thing as Charleston Bed Bugs! Bed Bugs (Cimex Lectularius) are small flat parasitic insects that feed solely on the blood of people and animals while they sleep. 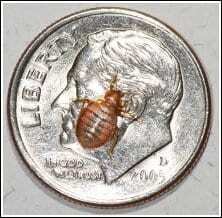 Bed Bugs are reddish-brown in color, wingless, range from 1mm to 7mm (roughly the size of Lincoln’s head on a penny), and can live several months without a blood meal. Bed Bugs are experts at hiding. Their slim flat bodies allow them to fit into the smallest of spaces and stay there for long periods of time, even without a blood meal. Most people do not realize they are transporting stow-away Bugs as they travel from location to location, infecting areas as they travel. If you have bed bugs it is not necessary to get rid of your mattress and box springs. Encasement will prevent bed bugs from hiding in your mattress and box springs, but if you have bed bugs in other places, they can still travel into your bed. Pesticides should not be applied to the top of the mattress, sofas, or other items where people have close contact. A Bed Bug encasement protects mattresses and box springs without pesticides. After cleaning the mattress, pillows and box spring, cover them with bed bug proof mattress and box spring covers or bed bug encasement that have been tested and proven to control bed bugs. These tight fitting bags keep bed bugs from getting into or out of a mattress or box spring and must be bed bug proof and rip-resistant. Good quality encasement are readily available at the Allergy Shop. Avoid plastic encasement that are uncomfortable and may tear easily. Tightly zip the encasement closed so that the little critters do not crawl through a gap at the end of the zipper. Leave the encasement on for a minimum of one year.